Businesses today are eager to leverage predictive analytics, yet very few have actually invested the number of hours required to generate tangible results. This is quickly changing in the industrial space where stakeholders across IT and OT have made it a priority to work together to prevent unexpected breaks in equipment and other surprises that lead to lost revenue, higher operating costs, service interruptions and more. These companies have exhibited a high aptitude for not only goal-setting and data prep, but have gone to great lengths to understand the nuances of their equipment, operating environments and business needs. All are key processes in applying the science of predictive analytics to improve business outcomes. For the longest time, electricity demand patterns were static at Itron, a leading provider of utility and smart city technologies. The company forecasted demand by analyzing simple figures, including the number and density of homes against historical records. However, the introduction of electric cars, solar panels and more began to complicate demand forecasting. With regulations dictating the amount of electricity utilities must generate to meet consumer demand, the added complexity created an issue. The company decided to use predictive demand (sometimes called forecasting) to better anticipate customer needs. By leveraging IoT capabilities across their thousands of installed smart meters, the company was able to harness real-time data to ensure no under- or over-production of energy. Tip: Accessing the full value of thousands of devices in the field requires advanced remote capabilities, such as monitoring and updating. To meet this requirement, Itron established an IoT device management strategy that would make it easy to manage devices and conduct batch updates without the need to visit and manually service devices. Mobile device management tools are not meant for this kind of purpose. Businesses need greater scale, flexibility and configurability from a true IoT device management solution. With the rise of IoT in the transportation industry, commercial truck manufacturers are turning to predictive analytics to maximize the time their fleets are on the road. One American truck manufacturer is harnessing the real-time performance data generated by numerous sensors embedded in their vehicles’ engines and other major components under the hood. This data enables predictive vehicle maintenance, a proactive approach that flags repair needs in advance. This has significantly improved asset reliability and longevity, lowered service costs, deferred capital expenditures and avoided unplanned downtime. Tip: Historical data is also an essential element of predictive maintenance programs. A record detailing engines operating normally as well as engines exhibiting problems provides a baseline against which to compare real-time operational data. 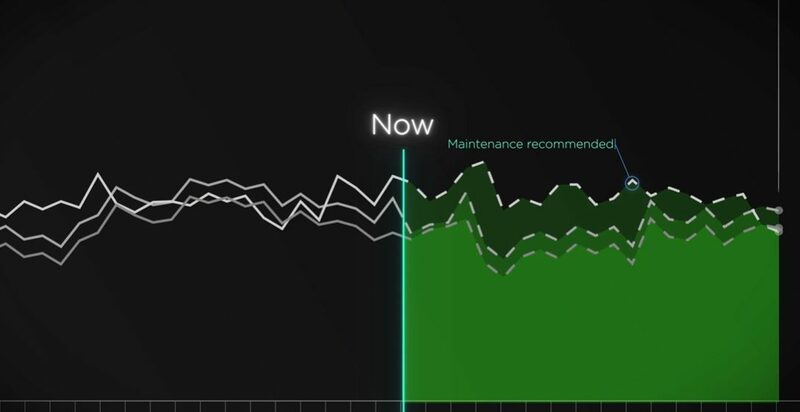 With this context, organizations can use predictive analytics to proactively schedule maintenance, better set technicians up for success and streamline repair processes. Monitoring the health of critical production equipment, such as pumps, and preventing unforeseen failures is paramount in the oil and gas industry. Without a backup option, a facility can be forced into an unplanned shutdown. Because these facilities often run nonstop, lost production time begins impacting financials immediately. Add those downtime costs to the price of emergency repairs, and suddenly you have a very expensive problem. Failures of this nature can also introduce contaminants into the production pipeline, which run the risk of corrupting product quality and damaging equipment downstream. Furthermore, they can lead to a line breach, which can carry a steep cleanup price tag. With data insights into a pump’s health (and like assets across a population), a production facility can predict this upcoming failure. Once aware that an asset is headed for trouble, management can proactively schedule repairs to minimize the impact on production and prevent unfavorable events, such as unnecessary cleanup costs and equipment damages. Tip: Predicting failure of a specific piece of equipment requires visibility into all necessary data points. This requires deep insights from internal SMEs into the operating characteristics of equipment, as well as other important data sources to a field deployment such as weather conditions. Adding context to data provides the best results. Predictive analytics is unlocking new value for businesses. But it’s important to remember that these are not quick, one-and-done exercises. Success requires a long-term commitment to continually refining and improving a program to maintain consistency and accuracy while accounting for any changing conditions. If you’re looking for some inspiration, look no further than the industrial sector, which is leading the way and offers some great examples of how to achieve success.